JEAN-MICHEL OTHONIEL “Les Noeuds de Babel” is Jean-Michel Othoniel’s fifth solo exhibition at Galerie Perrotin. For this exhibition, Jean-Michel Othoniel presents four new monumental sculptures and watercolour sketches inspired by Brancusi as well as the colours and forms of Italian Mannerism to the Baroque, developping “the question of the lost body. It’s a matter of creating a volume of absence, constructions with variable dimensions where bodies could nest… There is the idea that there is a body at the center… This refers to the idea of the haloes and aureoles of my earlier sculptures. 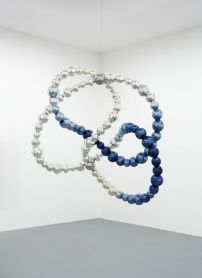 In my last sculptures, there is something like a body at the center and a knot around; the knot organises itself around an axis and defines a void”. These artworks materialized the psychoanalytic theory of the Borromean rings that structures a subject with a fragile equilibrium between Reality, Symbolic and Imaginary but seem to have been distorted here by an invisible dynamic, capturing the abstract essence of the movement. Echoed by five mural pieces made of glassbricks, ”Precious Stonewall”, refers to minimal art by metonymy of the eponymous monumental work shown recently during the retrospective “My Way” at the Centre Pompidou and the Brooklyn Museum. These were produced in India at Firozabad and suggest at the same time the visible pile of bricks on the Indian roads and the numerous altars covered with gifts, jewelry and flower necklaces… They also refer to the Stonewall riots of 1969 in Greenwich Village that led to the birth of the Gay Rights Movement. The silence emanating from these works renders them eloquent pieces. The ambiguity of the artist’s works also lays in the equivocal nature of the glass, sacred, refracting a divine light, as stained-glass would in a church, or a secular one, symbolizing the transparency of desire when it becomes a mirror. At the same time, the artist presents his “Herbier Merveilleux” at the Musée Eugène-Delacroix until the 18th of March 2013, unveiling the secret meaning of flowers; watercolours as well as sculptures resonating with paintings by the nineteenth-century master, in the exhibition “Eugène Delacroix. Des fleurs en hiver. Othoniel, Creten”. Another solo show will be dedicated to the artist at the Savannah College of Art and Design (USA) from 12 February to 5 May 2013. With the landscape designer Louis Benech, Jean-Michel Othoniel has been chosen to restore the Water Theatre’s Grove in Versailles in 2014. For this occasion, he will create four permanent monumental fountain sculptures at the heart of the gardens of the Palace of Versailles.